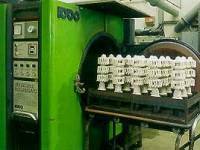 The final stage of the manufacturing process is creation of the ceramic shell for precision metal casting. It is performed after the coating operation. De-waxing is accomplished by melting the wax pattern with the use of steam. The melted wax then drains out of the ceramic cavity. The basic aim is to expose the wax in the shell cavity to a sudden burst of heat which increases the medium temperature around the shell, and thus the wax temperature, as much as possible and in the shortest amount of time. This process has the desired effect of draining the wax pattern from the ceramic shell.